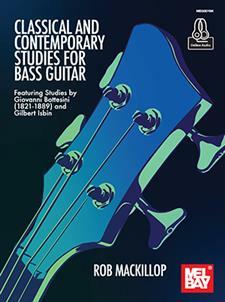 Classical and Contemporary Studies for Bass Guitar combines essential studies from 19th– century composer Giovanni Bottesini; the “Paganini of bass”, with contemporary studies by Gilbert Isbin; one of the leading European composers for guitar, lute and bass. These 33 studies will help build not just your technique, but reading abilities and overall musicianship. The material is intended for serious bass students and can be played on a fretted or fretless bass. While Bottesini’s works lie firmly in the classical genre, Isbin’s studies bring in elements of classical, jazz and world music. All the studies are written in standard bass clef notation as well as tablature. Includes access to online audio recorded by Rob MacKillop for each study.